Arctic warming goes with the floe | Watts Up With That? I’ve stated here on several occasions that the ‘Recent’ Arctic ice thinning is more likely a current change issue rather than a temperature issue. Differences in flow change the transfer of vastly more energy than a couple of degrees of air temp, however changing air temperatures are a strong indicator of differences in regional water flow. This effect is very visible in the arctic ice videos posted here. Recently Dr. Arnd Bernaerts asked by email that I call attention to his paper on Arctic Warming for a period we don’t hear about enough. He has a shorter version link which he also gave here. I really enjoy the historic discussions of climate and the paper is quite readable so I’ve put the whole paper up instead. The Arctic has a crucial role in the world’s climatic system, and global warming may have an amplifying effect. The recently observed thinning of the sea ice has alerted scientists and policy makers alike. That was quite different when a similar warming occurred 90 years ago, which is still regarded as one of the most puzzling climatic event during the last century. That needs not to be, if the situation is being viewed from on oceanic perspective, together with the fact that the winter air temperatures in the higher Northern Hemisphere are greatly influenced by the ocean, particularly in the North Atlantic, which is partly free of sea ice up to the Fram Strait. Here also ends the West Spitsbergen Current, a current which supplies the Arctic Ocean with warm and saline Atlantic water. Already back in 1920s air temperature observation showed a strong warming at Spitsbergen during the winter season. By analyzing the winter temperature profile of five coastal stations it can be demonstrated that the climatic shift at the end of the 1910s had been closest to Spitsbergen, allowing the conclusion that circumstances related to the West Spitsbergen Current have caused the early Arctic warming almost a century ago. The term “circumstances” implies the observation or influence of “existing conditions”. Here the use of the term shall mean the presentation of circumstances which rectify to draw certain conclusions concerning the period of Arctic warming in the early 20th Century on how it started and how it shaped up. The paper will cover both aspects, but with a clear priority for the circumstances around the year 1919 when the warming started. The method of investigation will be explained in the second section of the paper, based on a general picture that will be presented first of all. The third section is about the “circumstances” which will analyze temperature records in the Northern North Atlantic realm that may provide clues concerning the location, the timing, and the likely source of the warming event, and thereon discuss the information. The general situation from the late 1910s to the 1940s is well illustrated by the annual temperature records from Spitsbergen, Angmagssalik, and Andenes (Fig. 4 to 6). They indicate a shift of the mean temperature level of approximately 1.5 to 3 degrees between the decade prior and after 1920, and that the period with an increased mean lasted until about 1940. The temperature anomalies are due primarily to natural variability in the weather system (Overland, 2008:81). Such notions explain too little. The matter becomes even more critical if claimed without sufficient prove, for example: That the past 100 years are significant for the changeover of a climate system dominated by natural forcing to a climate system dominated by anthropogenic influences, as done recently by S. Brönnimann et al., while admitting that “Our understanding of the climate mechanisms operating in the Arctic on different timescales is still limited”. (Brönnimann, 2008: 3, 20) Is it helpful to dramatize the shrinking sea ice during a recent time period, if one is not fully aware of what happened in the early years of the last century? Actually, few but sufficient air temperature data are available since long time. The paper will use them to show that the early warming was initiated and sustained over two decades by the West Spitsbergen Current, a branch of the Gulf Current in the North Atlantic. Naming the sea as the cause of the Arctic warming from 1919-1939 could help to understand better the current situation in the Arctic. On the 2nd of November 1922, The Washington Post published the following story: “Arctic Ocean Getting Warm; Seals Vanish, and Icebergs Melt”. The corresponding report in the Monthly Weather Review of November 1922 (Ifft, 1922:589) had also stated that the ice conditions in the Northern North Atlantic were exceptional; in fact, so little ice has never before been noted. Few years later the Spitsbergen data were published with the accompanying text saying that it is “Probably the greatest yet known temperature rise on earth (Birkeland, 1930:236). One of the first to investigate the EAW was R. Scherhag with two papers in 1936. The first he called “A remarkable climatic change across Northern Europe” (Eine bemerkenswerte Klimaänderung über Nordeuropa”) (Scherhag, 1936a:96), while the second draws the attention to the change of temperatures and atmospheric circulation during the previous 15 years since 1920, (Scherhag, 1936b:397). The WWII ended the lively discussion. As at the same time not only the exceptional warming in the Arctic ended, but actually the Northern Hemisphere went through a global cooling for three decades, the EAW was a non-issue for more than 50 years, only returning back on the agenda with the debate on global warming, and when the Arctic summer sea ice started to diminish significantly in the 1990s. The EAW offers a unique opportunity to confine the analysis to two aspects concerning the warming from 1919-1939, namely with regard to the annual season and geographical localization. Due to the lack of any sufficient sea surface temperature data (SST), the investigation will assess the warming conditions only by the use of surface air temperatures (SAT). It will furthermore confine the investigation to the winter season for two reasons. Only the winter seasons from 1919 to 1939 show a strong warming, while the increase during the summer periods is only modest. The direct influence of the sun can be neglected during the winter season. The sea, as far as not covered by sea ice is getting a dominating role during the sunless winter season. The reduced influence of the sun during the winter season is the pre-eminent factor. Instead, in the northern part, north of Iceland and the Shetland Islands, the ocean is providing the bulk of heat to the atmosphere. After all, higher temperatures must have been generated by something; either the rise had been observed in the location, or at another place, which could be identified, from where the heat had been transported to the place of measurement. For this purpose some coastal stations, in close reach to the sea, will be analyzed with regard to the timing and values of changes observed. Significant difference diversions, delays may rectify drawing not only the conclusion that the EAW generated in the North Atlantic, but also that it was generated by the West Spitsbergen Current. The core period for the investigation are the years around 1918/1919 when the warming started. The suddenness of the shift could be one of the key indicators for the mechanism of the change. However as the number of stations eligible for such investigation is very limited, it seems advisable to present at first the EAW period from 1919 to 1939, so that the analysis of individual stations is seen in the wider context of the period. Showing that the cause of warming had been due to the sea could possibly even answer the question concerning the “change in air circulation” (see above: Scherhag & Brooks), or the question a Russian scientist raised ten years ago: Why are the maximum climate fluctuations confined to the Atlantic sector of the Arctic?” (Zakharov, 1997:71). A higher heat release from the sea will inevitably influence the winter temperature and the atmospheric circulation, locally and in a wider region. It is furthermore reasonable to choose the region where the Arctic Ocean and the Atlantic meet, as it is acknowledged since the 1930s that the center of the warming had been here, as the material by Scherhag shows (Fig. 7a-c). Even more recent research confirm that the warming occurred during winter close to the Fram Strait and the pick was in the wider region of Spitsbergen, with a varying intensity from south-west Greenland to the Russian Island, Severnaya Zemlya, at 80°N and 100° East; see Figure 8 for the 1920s, and Figure 9 for two decades from 1920 to 1939. Although all stations are close to the sea, they are not necessarily close to open water, due to very different sea ice conditions. This is particularly the case with regard to the eastern coast of Greenland where a current is moving cold water from the Arctic southwards. The maximum sea ice extend usually appears in April and may vary considerably from year to year. Insofar the sea ice conditions during winter 1917/18 (Fig. 11a-c) reflect an average situation. On first view the annual record of the stations presented (Fig. 4 to Fig. 6) seem to be quite identical. Prior to the year 1920 all stations have a lower level of temperatures over the years shown than thereafter. At a second glance one can observe that prior to 1920 the lowest annual value differs between west and east of the North Atlantic. In the former it is 1918 and in the latter it is 1917. After these years all stations, except Angmagssalik, observe an increase of the values, which is very pronounced at the eastern stations, with a first maximum in 1920. At Grimsey the increase is modest. At Angmagssalik the value for 1920 is actually lower than in 1919. However, the increase of the annual values for two decades at all stations is not very impressive. The following Figures 12 to 16 show the combined figure for the winter months January, February and the previous December (D-J-F). Which are the general observations that can be made (without Spitsbergen)? At the Norwegian stations, there was, prior 1919, a longer period of cooling since about 1914. At the stations Angmagssalik and Grimsey the period from 1912 to 1917 remained in a moderate band, with only one big exception, in 1918. (see below). What is particularly significant regarding the Spitsbergen data? A much higher range of temperature variations (10°C between 1918 and 1919) towards the other stations (e.g. Vardø ca. 2°C). In January 1919 the mean was as low as –5.7°C, while the pervious years had been well below –20°C (except 1915, -12.5°; and 1913, -14°C). From thereon the January mean got warmer (e.g. in 1922, -3.8°; and 1933, -2.3°). The following table shows that the other stations are quite distinct from Spitsbergen in this respect. Table 2: A comparison of the January 1919 with the years 1916 to 1918 at five stations (Fig. 9). While the time period from 1912 to 1917 corresponds largely with the data from 1920 to 1923, the 1918 value with –13.8°C is surprising and unique in the data record since 1895. The previous coldest winter 1896 was –11°C. The enormous temperature variation at these stations in 1918 is confirmed by three other Iceland stations. For example, with regard to Reykjavik, the D-J-F figure is for the years: 1917 (-0.3°); 1918 (-3.5°); 1919 (-0.8°), and 1920 (-2.5°), showing the next negative figure only ten years later in 1931 (-0.3°). However, any correlation with the start of the arctic warming seems remote. Here we can only guess that the low temperature had been supported by a temporary and regional change of sea surface temperatures, which might have been enhanced by colder water in the Northern North Atlantic that had also bought colder conditions to the Norwegian stations and Spitsbergen over the brief period of time from about 1914 to 1918. On first glance, the temperature trend at the three stations looks as if there is little to comment. The general trend is quite comparable, although it is noticeable that the cooling phase prior 1920 had ended at Spitsbergen in 1918, and one year later at Andenes and Vardø, in 1919. Furthermore the figure value of changes is remarkable different. Although it seems to be a very modest aspect, with regard to the prevailing sea current system in the region, presumably it is of considerable relevance. Actually, all three locations are directly connected to the warm North Atlantic Gulf Currents. Along the coast of Andenes is the Norwegian Current, which separates here into the West Spitsbergen Current carrying warm water northwards to the Arctic Ocean, and the North Cape Current moving eastwards with warm water for the Barents Sea. As all three stations are in a very close distance to the warm water currents mentioned, the huge difference in the change of temperature is remarkable. Furthermore, the distance between Spitsbergen and the two continental stations is with less than 1,000 kilometers, not only quite modest, but due to the considerable speed of the currents, the water needs from Andenes to Vardø, and Spitsbergen only a few weeks. Insofar one could have expected a much less difference between the north and the south, a matter which will be raised in the next section again. One Scherhag figure (Fig. 7) indicated that there was a warming at the South-West coast of Greenland from 1920 to 1930 as well. The station Godthab Nuuk, which is representative for few other West Coast stations, shows a temperature shift starting with the year 1923 (Table 3). The succeeding two years, 1921 and 1922, had been below the previous average. Winter temperature (D-J-F) 1912-1941; Source: NASA/Giss. The warming period since 1923 is modest and rather short, lasting only until the early 1930s. Two further figures published by Scherhag, here redrawn (Figure 17 and 18); do not indicate a significant warming in south-west Greenland since the mid 1930s. Concerning the full time period in question, from the late 1910s to 1940, it is not easy to assess the situation during the initial years of the period, while a substantial warming during the 1930s is well established for many decades. With reference to the Scherhag figure (Fig.7) the 1920s indicate only a modest rise of the winter temperature, which can be attributed to the increase at Spitsbergen and Greenland and carried from there with the Jet-Stream eastwards to Severnaya Zemlya Island and beyond. This explanation is not sufficient for the strong warming in the east of Spitsbergen during the 1930s, which is not only confirmed by the Scherhag figure (Fig. 17 & 18), but also by Figure 8 which is based on an image published by H.H. Lamp in 1982. The strong warming since the mid 1920s was presumably enhanced by Atlantic water that had entered the Arctic Ocean, and moved eastwards along the continental shelf in the Nansen Basin. Due to observation by Polyakov et al. that a sea water anomaly would need app. 4 to 5 years to reach the Laptev slope (Polyakov, 2005:1), which is immediately east of Severnaya Zemlya Island. However, it can not be excluded, that an impulse came also by the North Cape Current via Barents Sea and Kara Sea. As there is no indication what so ever, that any heating potentials had been in this region prior the warming at Spitsbergen, the issue is here not further scrutinized. The basis for discussing the matter is the widely acknowledge fact that the center of the Arctic warming in the early 20th Century was Spitsbergen, covering a region from south-west Greenland to the Russian Island Severnaya Zemlya. This was at least the situation in the initial phase. It is therefore possible to concentrate fully on the circumstances of the warming, with regards to when and why. Despite the great shortcomings in knowledge about the way the Spitsbergen Current changed during the first decades of the last century; one aspect may provide a hint, namely the suddenness. All presented temperature plots record a fairly modest variation, before it came to a very brief cooling around 1916 to 1918, after which a very brisk temperature rise occurred at all stations. The rise between 1918 and 1923 actually resulted in a shift of level. The annual temperature figure for three stations (Fig. 4 to 6) demonstrate very clearly that the level before 1920 was significant lower than after 1920. This sudden shift gives the observation by Schokalsky (see above) special weight, whereby the thickness of the cold sea surface layer of 200m in Nansen’s time (about 1893-1896) has been found reduced to less than 100 meters in thickness about 40 years later. This would release more heat to the atmosphere. But as mentioned already, the warming prior 1920 was very modest, which could mean that the status of the surface layer had been fairly constant. This consequently allows the conclusion that the thinning of the cold surface layer came very suddenly and during a brief time frame, from 1918 to 1923. Already in 1922 The Washington Post could report: “Arctic Ocean Getting Warm; Seals Vanish and Icebergs Melt”. Under the prevailing circumstances as elaborated here it seems rectified to account the change in circulation as source for the warming as claimed by R. Scherhag (see above), to the same source that generated significant warmer air temperatures at Andenes, Vardø, and Spitsbergen. It would be the account Brooks had asked for (see above). The sudden warming of the Arctic in the early 20th Century is presumably not as puzzling as elsewhere assumed if investigated on three parameters, namely winter temperature observation in the region, the prevailing sea ice conditions, and the impact the sea has on air temperatures at high latitudes during the sunless winter season. The observed temperature profile at several representative coastal stations in the Northern North Atlantic, indicate that the most northern station on Spitsbergen observed the change into a warmer stage first and most pronounced. As this change came with an unknown suddenness, and the temperature increase had evidently not been carried from outside the Arctic Ocean and Northern North Atlantic into the Spitsbergen region, the source of the warming is the West Spitsbergen Current, which must have seen a substantial system shift within a very short period of time. Particularly the explosion of the temperatures and showing up in the subsequent winters until 1940 leave little room for any other option. The circumstances of the Arctic warming since the winter 1918/19 are ocean related in general, and the West Spitsbergen Current in particular. How the shift came about so suddenly is not to be answered here, but the observation published by J. Schokalsky in 1936, that “the surface layer of cold water which was 200 meters thick in Nansen’s time, has now been reduced to less than 100 meters in thickness“, could have happened over a time period of 2-3 dozen years, but also within a period of several months. The sudden thinning of the sea surface layer in the high North could be an interesting starting point to bring more light in the early Arctic warming. Bengtsson, L., Semenov, V.A., and Johannessen, O.M. (2004), “The Early Twentieth-Century Warming in the Arctic—A Possible Mechanism”, Journal of Climate, Vol. 17, pp. 4045-4057. Birkeland, B.J. (1930), „Temperaturvariationen auf Spitzbergen“, Meteorologische Zeitschrift, Vol.47, pp. 234-236. Brooks, C.E.P., (1938); “The Warming Arctic”, The Meteorological Magazine, Vol.73, pp.29-32. Brönnimann, S., Ewen, T., Luterbacher, J., Diaz, H. F., Stolarski, R. S. and Neu, U. (2008) “A Focus on the Climate During the Past 100 Years”; Springer, Dordrecht. Ifft, G.N. (1922), “The Changing Arctic”, Monthly Weather Review, Vol.50, p.589. IPCC (1990); Houghton, J.T., Jenkins, G.J., Ephraums, J.J. (ed); „Climate Change –The IPCC Scientific Assessment“, Cambridge University Press, Cambridge. IPPC (2007a); „A report of Working Group I of the Intergovernmental Panel on Climate Change, Summary for Policymakers“, pp. 1-18, viewed 25 May 2009, http://www.ipcc.ch/ . IPPC (2007b); „A report of Working Group I of the Intergovernmental Panel on Climate Change, Technical Summary“, pp. 21-91, viewed 20 May 2009, http://www.ipcc.ch/ . Johannessen, O.M., Bengtsson, L., Miles, M.W., Kuzmina, S.I., Semenov, V.A., Alekseev, G.V., Nagurnyi, A,P., Zakharov, V.F., Bobylev, L., Pettersson, L.H., Hasselmann, K., and Cattle, H.P. (2004); „Arctic climate change – Observed and modeled temperature and sea ice variability“; Tellus, 56A, pp. 328 –341, Corr., pp. 559-560. Lamp, H.H. (1982 ); „The Climate Environment of the Arctic Ocean“, in: Louis Rey (ed), ‚The Arctic Ocean’, Macmillian Press, London, pp. 135 – 161 (Fig. 7.10a). Overland, J.E. (2008); „Arctic change: multiple observations and recent understanding“, Weather, Vol.61, pp.78-83. Polyakov, I.V., Bekryaev, R.V. ; Alekseev, G.V., Bhatt, U.S., Colony, R.L., Johnson, M.A., Makshtas, A.P. and Walsh, D. (2003); „Variability and trends of air temperature and pressure in the maritime Arctic, 1875 – 2000“; Journal of Climate, Vol.16, pp. 2067-2077. Polyakov, I.V., Beszczynska, A., Carmack, E.C, Dmitrenko, I.A., Fahrbach, E., Frolov, I.E., Gerdes, R., Hansen, E., Holfort, J., Ivanov, V.V., Johnson, M.A., Karcher, M., Kauker, F., Morison, J., Orvik, K.A., Schauer, U., Simmons, H.L., Skagseth, Ø., Sokolov, V.T., Steele, M., Timokhov, L.A., Walsh, D. and Walsh, J.E..; (2005), „One more step toward a warmer Arctic“; Geophysical Research Letters, 32, L17605, doi:10.1029/2005GL023740. Scherhag, R. (1936a) ‘Eine bemerkenswerte Klimaveränderung über Nordeuropa’; Annalen der Hydrographie und Maritimen Meteorologie, Vol.64, pp. 96-100. Scherhag, R (1939) „Die Erwärmung des Polargebiets“; Annalen der Hydrographie und Maritimen Meteorologie, Vol.67, pp. 57-67. Schokalsky, J. (1936); “Recent Russian researches in the Arctic Sea and the in mountains of Central Asia”, The Scottish Geographical Magazine, Vol. 52, pp. 73-84. Serreze, M.C. and Francis, J.A., (2006), “The Arctic Amplification Debate” , Climatic Change, Vol.76, pp. 241-264. Zakharov, V.F. (1997), “Sea ice in the climate system”, World Climate Research Programme/Arctic Climate System Study WMO/TD-No. 782, 80 pp. November 4, 2009 in Arctic, Sea ice. Thanks Jeff, a great piece. There is nothing like observation build a sense of what is normal and natural around. It can’t have been as bad then as it is now since we have polar bears now and all the polar bears would have died then like they are dieing now and then we wouldn’t have polar bears around to die. This paper is of importance not just for understanding the Arctic but climate change at a global level. As long as GCMs are not able to model the first warming period, in the Arctic and globally, it will be hard to convince climate change sceptics of the validity of the models’ prediction for the future. But I thought recent warming in the area was unprecidented and “worse than we thought”. Oh well that was then and this is now. There is obviously no reason to assume modern events have anything but an anthropogenic origin is there? I find reading more than a page or two difficult on-screen. Is there a .pdf I can print & read? 1st thought is that the author seems to accept AGW which I don’t but being unable to read it properly I can’t as yet comment further. Thanks Jeff for presenting Dr. Bernaerts’ excellent work. Very insightful and comprehensive. Needed: a similar study of the recent warming, and possible causal influences. The Gakkel Ridge lies under the Arctic sea and it has recently been found that volcanic activity has occurred over the years. Could this activity be part of the reason for sea-ice melting during the early ’20s and at present? This article was a long shaggy dog story. I didn’t have the patience to read all of it. I don’t see what it proves about anything. It points a finger at the Spitzbergen current as the source of Arctic warming. What are we to conclude from this about today’s Arctic warming based on this? “Presentation of a number of papers seeks to demonstrate that the industrialized world contributed to at least two significant climatic changes during the 20 th century. Large-scale anthropogenic weather modification and climatic changes resulted from two destructive sea wars. This became particularly obvious when an arctic winter befell Northern Europe only four months after World War II had started. To establish a definite connection between war at sea and climatic change, climatic data for first few months of WWII are analyzed in fourteen theme papers. Thereon further climatic data is analyzed in respect of subsequent two war winters of 1940-41 and 1941-42, in six supplementary papers. It can be seen that record cold winters occurred in Europe only. Scope of this investigation is to establish that two major climatic changes during the last century, viz. two decades of warming before WWII and four decades of cooling from 1940-80, are also closely linked to war at sea. WWI presumably initiated the warming process; and WWII definitely transformed the world into a cooler state. A total of nine papers cover various findings in this respect. For getting a preliminary overview, following topics, viz. North Sea cooling (2_16); Three-year-package (3_31); Sea system effected (4_12); Spitsbergen heats up (5_12); and Climatic shifts (6_11) provide a basic picture of scope, method and contents of this research. Needless to say, I haven’t read the 325 pages, but it seems that he is blaming what happened on human activity. Nice piece, thanks. It’s always worth remembering there is a difference between “skeptics” and “deniers”, and this is a skeptic piece. It is not enough to say that just because natural variation *could* cause what we’ve seen in recent years that it therefore *must* have caused what we’ve seen in recent years. Maybe it did. Maybe it didn’t. Maybe there’s a combination of natural variation and C02 forcing going on and it is worth our while to keep working hard at understanding what is happening and arriving at a roughly correct apportioning of the causes. Signing on to all three of the previous sentences of this para is the difference between a skeptic and a denier. But then it has never been the skeptic community who has tried to shout down everyone else with a “the science is settled” arguement. See also: http://www.appinsys.com/GlobalWarming/ArcticCycles.htm which also shows the strong correlation of Arctic temperatures to PDO+AMO. See: http://www.appinsys.com/GlobalWarming/RS_Arctic.htm for a comprehensive look at Arctic climate data. Harald Yndestad has found 1920s phase reversals in NAW (North Atlantic Water), NAO (North Atlantic Oscillation), and other climate indices – for example some readers here might find his analysis of Stockholm sea level interesting. Dr. Yndestad is developing plans to test his theories. Probably not directly, but it’s certainly worth looking at. Remember, too, that heat transfer from volcanic activity need not be sufficient to melt much ice. It need only affect the viscosity of seawater sufficient to influence the flow pattern, as described by Dr. Bernaerts and others. Seawater viscosity is many times more sensitive to temperature than density is. Also, viscosity would be affected by the presence of dissolved gases such as might be emitted by undersea volcanic vents. Eric, keep your hair on mate, your talking about weather not climate. It would be interesting to see the Spitzbergen annual average and winter average temperatures (raw data) from 1912 to today. Are they available somewhere? Didn’t a similar brief warming spell also occur in the mid 19th Century? I really appreciate Jeff collecting this gem, but it would be nice to also have a credit to the authors of the paper in the subtitle. ___(DAVE) : Is there a .pdf I can print & read? (c )—together with the work that has kindly be mentioned by “Eric A (04Nov; 20:11:52)” concerning climatic shift towards a three decade global cooling, which started with the winters 1939/40, 1940/41, und 1941/42, the coldest in Northern Europe for a century. In both cases WWI and WWII had been close! The seas and oceans had seen though times. Did the naval war kicked off the mentioned climatic events, of which neither has been yet convincingly explained. It looks like peer-reviewed science, it smells like it, but has it been published yet? I still can see some obvious typos here and there. Was it ever published or is it another sort of Teuschner-like “publication”? Svalbard is often referred to as an example of a significant 20th century temperature rise (almost 4oC). In this context, however, it should be noted that this temperature increase almost entirely took place within the period 1915-1922, as is shown in the diagram below. This temperature rise was concurrently experienced at most other North Atlantic measurement sites and was presumably caused by North Atlantic oceanographic changes. There appears to be a great similarity between this sudden step change in temperature with oceanic temperature changes in e.g. Alaska at PDO phase shift, such as around 1977. Perhaps a global pow-wow of those studying all phenomena of this type globally might be in order to see if any pieces of a jigsaw appear to produce some sort of coherent picture? Further to Paul Vaughan’s note, it is odd that Arnd Bernaerts does not use the substantial body of knowledge about the role of teh Lunar Nodal Cycle in the regulation of the Arctic’s climate.Harald Yndestad, who Paul Vaughn mentions, is one of the principal researchers in this field. During late April/early May this year there was a good paper, a fascinating and informative discussion and many relevant, authoritative links about the PDO on WUWT here: http://wattsupwiththat.com/2009/04/28/misunderstandings-about-the-pacific-decadal-oscillation (aka http://tinyurl.com/mt5vwu ). In a paper published in March this year, Dr. Ichiro Yasuda, Professor, Ocean Research Institute, The University of Tokyo showed that the Luna Nodal Cycle drives the PDO. The citation is: Yasuda, I. (2009), ‘The 18.6-year period moon-tidal cycle in Pacific Decadal Oscillation reconstructed from tree-rings in western North America’, Geophysical Research. Letters, 36, L05605, doi:10.1029/2008GL036880. Time-series of Pacific Decadal Oscillation (PDO) reconstructed from tree-rings in Western North America is found to have a statistically significant periodicity of 18.6- year period lunar nodal tidal cycle; negative (positive) PDO tends to occur in the period of strong (weak) diurnal tide. In the 3rd and 5th (10th, 11th and 13rd) year after the maximum diurnal tide, mean-PDO takes significant negative (positive) value, suggesting that the Aleutian Low is weak (strong), western-central North Pacific in 30–50N is warm (cool) and equator-eastern rim of the Pacific is cool (warm). This contributes to climate predictability with a time-table from the astronomical tidal cycle. The last LNC maximum happened on September 16, 2006. According to Prof Yasuda’s finding the PDO should now be taking a significant negative value, as is being found. The climate consequences are therefore as expected. There is substantial evidence that the LNC is a significant contributor to our planet’s climate dynamics. I include a carefully written and illustrated explanation of the LNC and review a lot of the published literature about its contribution to climate dynamics in my paper “The Sun’s role in regulating the Earth’s climate dynamics” published in the Journal of Energy and Environment Vol 20 No 1 2009. 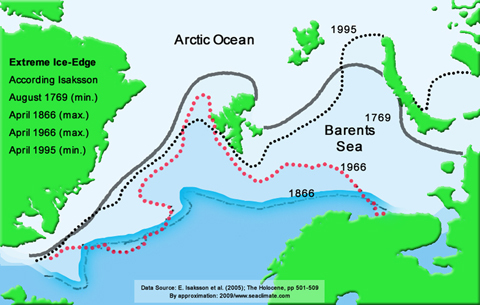 “The ocean currents generated by the northward movement of the tidal bulge, in conjunction with the rotation of the Earth through the bulges in the normal manner creating our experience of the tides, brings warmish equatorial water to the Arctic accelerating the warming that had being going on there because of other forms of solar activity as discussed below. The effect of the LNC is amplified by the distinct geography of the high latitude oceans, e.g. the North Pacific and the Bering and Okhotsk Seas. Prof Yasuda and his colleagues have been researching the role of the LNC for several years. Their work is meticulous and rigorous. It builds on other published research in this field over the last forty years, which I’ve reviewed in my Journal of Energy and Environment paper. Several correspondents have asked about relationships between the 18.6 yr Lunar Nodal Cycle (LNC) and the 18.03 yr Saros cycle. Others have asked about interaction effects between solar periodicities of whatever type and the LNC. This note is a response to these queries. It is essential to understand that the LNC and Saros cycles are fundamentally different categories. The LNC is the period of a full rotation of the Moon’s orbital plane around the geometric plane of the Earth’s orbit around the Sun (the ecliptic). The Sun’s gravitational field makes the Moon’s Earthly orbit swivel around in a clockwise manner, over a cycle of 18.6 years, with respect the ecliptic, which is the plane of the Earth’s orbit. The Moon moves with respect to the ecliptic up and down a northerly latitude throughout the LNC. This arises because the Earth is titled on it axis and inclined away from the Sun and because the Moon’s orbit is tilted a little relative to the ecliptic. It is as if the Sun strives to pull the plane of the Moon’s orbit into its own plane, the ecliptic. But there is an alternate motion at right angles to the applied force, resulting in a revolution of the pole of the Moon’s orbit around the pole of the ecliptic. The LNC defines how the angle of the Moon’s orbit to the Earth’s equatorial plane combines with, or partially cancels out, the tilt in the Earth’s axis. From the perspective of an observer on the Earth, during the LNC the Moon moves along a northern latitude about ten degrees from a position about 18.5 degrees north of the equator to one that is 28.5 degrees, which it reaches after 18.6 years. The LNC was first reported by John Bradley in his grandly titled “A Letter to the Right Honourable George Earl of Macclesfield Concerning an Apparent Motion observed in Some of the Fixed Stars”, published in Philosophical Transactions of the Royal Society, Vol 45, London, 1748, pps 1 to 45. Professor Bradley read his paper at a meeting of the Royal Society on February 14, 1747. James Bradley was Savilian Professor of Astronomy at Oxford and in 1742 he succeeded Edmond Halley as Astronomer Royal. The Saros cycle is a means for predicting lunar and solar eclipses. The word “Saros” means “repetition” was given to the cycle by Edmund Halley in 1691. The Saros cycle is 6,585.277 days long, but depends on the number of leap years in the cycle. After one Saros cycle, the Earth-Sun-Moon geometry will be nearly identical: the Moon will have the same phase, be at the same node, and have the same distance from the Earth. If one knew the date of an eclipse, then one Saros Cycle later, a nearly identical eclipse should occur. (i)	the time between lunar phases e.g. two full moons; this month is known as the synodic month. (ii)	(ii) The time between two passages of the Moon at the point at which it is closest to the earth (perigee): this month is known as the anomalistic month. (iii)	(iii) The time required for the Moon to return to the ascending node (i.e. crossing the ecliptic from south to north): this month is known as the nodal month (and also known as the draconic month). It is this month that links the Saros Cycle to the LNC. The Saros Cycle was devised around the fifth or sixth century BC by Chaldean astronomers (who in those days were called astrologers) because of the absolute importance of being able to predict eclipses. They had thousands of cuniform clay tablets made by the ancient Babylonians as their data base. The Chaldean equivalent of Rajendra Pachauri knew that fame, fortune and great power would be his if he could persuade the powers-that-be that he could predict things and make the powers-that-be seem godlike to the masses. The way to do that in those days was to be able to predict eclipses more accurately than anyone else. The Saros Cycle gave the top astrologers of the day that power. The Saros Cycle is now no more than a curiosity, an indicator of the observational skill, record keeping skills and (arithmetic) calculating skills of the ancients. We have far more sophisticated lunar ephemerides on the www than the Saros Cycle. Nevertheless, there are two important lessons for us moderns from Saros. One is that the existence of Saros means that there must be a periodic repetition of some special geometries and that this would mean there is resonance acting within the Moon-Earth-Sun system. Resonance is ubiquitous in the solar system. Resonance is the subtle gravitational effect of Newton’s laws at work that determines the dynamical structure of the solar system; and so with the solar system’s Moon-Earth-Sun sub-system. The second lesson, taking the resonance into account, is that if there can be demonstrated relationships between lunar periodicities and our planet’s climate dynamics, we can use the mathematics of the lunar periodicities to predict climate dynamics, just as the ancient astrologers used them to predict eclipses with such great success. Mazzarella and Palumba (1994) point out that bistable modes of oscillation with respect to time are well known in physical and engineering systems and have been extensively studied. This research from Physics and Engineering demonstrates that a sinusoidal force applied to any dynamic system induces sinusoidal periodicities in the system. Accordingly, the LNC induces bistable sinusoidal periodicities in the atmosphere (pressure, temperature and rainfall) and the ocean (temperature and sea level). The sinusoidal, highly stable 18.6 year LNC has a distinctive and significant effect on the Earth’s climate dynamics. There is a substantial published literature that shows the significant role of the LNC in regulating our planet’s climate dynamics. Amongst other things, it is largely responsible for the Pacific Decadal Oscillation. The Arctic Oscillation (AO) is regulated by the solar cycle in a non-linear manner. Heightened and weakened solar activity activates the large Rossby and Kelvin waves. The effects of these waves on atmospheric circulation are intensified by the creation of Ozone during times of increased solar activity. The AO is stronger with more zonal circulation over mid-latitudes, especially in the European-North Atlantic sector, and more variable during the peak of the solar cycle. The Rossby and Kelvin waves are large, slow inertial waves, or oscillations, that move through the atmosphere and the oceans, horizontally and vertically. Inertial waves are generated in any rotating fluid. They are therefore generated in the atmosphere and the oceans, which, of course, rotate as part of the planet. The inertial waves are, amongst other things, an effect of the Coriolis force generated by the Earth’s rotation. The AO is also regulated by the peak 9.3 year and 18.6 year LNC tidal oscillations. The processes by which the effect occurs are different from those of variable solar activity. The tidal oscillation impacts on atmospheric circulation and on the large Rossby and Kelvin waves. It also impacts on the churning of the oceans. Nevertheless, the two solar processes interact amplifying each other’s contribution. The AO has a key role in Northern Hemisphere climate variability and its behaviour is largely the result of the interaction of the solar cycle and the 9.3 and 18.6 year LNC tidal oscillations. Berger (2007) found that solar modulation of the NAO is amplified by tidal cycles. He found that there is non-linear resonance between solar cycles and tidal cycles, especially the LNC and the perigean tidal cycle the effect of which is to amplify solar modulation of the NAO. Treloar (2002), of the Queensland Centre for Climate Applications, Queensland Department of Primary Industries, reported that the variability in ENSO and seasurface temperature anomalies is partly a result of lunisolar tidal factors. The Moon and the Sun periodically amplify each other’s gravitational effect on the Earth in a non-linear manner that closely correlates with major earthquakes. These periodic non-linear amplifications produce elastic energy that resides in the Earth’s core and crust. Barkin and Ferrandiz (2004), Barkin et al (2005) and Barkin et al (2007) demonstrated that the variable gravitational field of the Sun, interacting with the Moon’s, generates a range of significant periodic changes amongst the Earth’s shell-like structures: atmosphere, oceans, liquid core, mantle, another layers and plates. Barkin and Ferrandiz (2004) derived an analytic expression for the elastic energy of planet tidal deformations induced by other bodies, including the central star, in a planetary system. The elastic energy is not simply a sum of the elastic energies of the separate pairs of bodies but contains additional terms which are non-linear functions of the superposition of the variable gravitational fields of the Sun, Moon and other planets. As a result, there are large and significant variations in conditionally periodic variations in the elastic energy of the gravitational fields of the Sun and the Moon, especially, but with additional coefficients for the planets. Some of the elastic energy is dissipated as heat and contributes, as the periodicities of the tides determine, to the warming of the Earth and the oceans. Most of the remainder is retained in the solid material of the Earth, resulting in deformations, ultimately in the form of earthquakes and volcanoes. Some of the elastic energy is retained by the Moon, resulting in moonquakes which correlate closely with earthquakes. The Moon and the Sun periodically amplify each other’s gravitational effect on the Earth in a non-linear manner that closely correlates with major earthquakes. Major earthquakes and moonquakes coincide with extreme variations in tidal elastic energy. The large additional mechanical forces and moments of interaction of the neighbouring shell-like structures of the Earth have significant impacts on climate dynamics, including the sea level. They produce cyclic perturbations of the tensional state of the shell-like structures, including deformations, small relative translational displacements and rotational oscillations, and the redistribution of the plastic and fluid masses of which the planet is composed. These additional forces and moments of a cyclic solar system nature produce deformations throughout the all layers of the Earth, regulating variations of almost all natural processes. Apart from the immediate catastrophes that earthquakes and volcanoes induce, there are also longer term climate change consequences. These non-linear gravitational effects of the Sun and the Moon on climate change can be calculated with reasonable precision. •	LNC maximum jointly with a Hale cycle minimum results in severe drought in the western US. •	LNC, in conjunction with resonance from the Rossby wave locked topographically into position by the Tibetan Plateau and the Rocky Mountains, most likely induced Northern Hemisphere droughts. •	LNC, in the Arctic, accelerates the warming effect of other solar processes, contributing to the melting of the Arctic ice and higher sea surface temperatures at northern latitudes. As a result, there is a larger volume of liquid water to respond to the tidal forces. In addition, the changes in ocean stratification that follow improve the mixing efficiency. •	LNC effects interact with the seasons because of the relationship between the tilt of the plane of the Earth’s equator in relation to the ecliptic (which causes the seasonal changes and the regular seasonal movements of the Sun north and south of the equator) and the rotation of the Moon’s orbital plane. Once every 18.6 years the plane of the Earth’s equator will tilt above the ecliptic in the same direction as the plane of the Moon’s orbit will tilt below it. Barkin, Yu, Ferrandiz, J., Ferrandez, M. G., Navarro, J., 2007. Prediction of catastrophic earthquakes in 21 century. Geophysical Research Abstracts, Vol. 9, 08643, 2007, SRef-ID: 1607-7962/gra/EGU2007-A-08643. Barkin, Yu. V. and Ferrandiz, J. M., 2004. Tidal Elastic Energy in Planetary Systems and its Dynamic Role. Astronomical and Astrophysical Transactions, 23, (4), 369 – 384. Berger, W. H., 2007. Solar modulation of the North Atlantic Oscillation: Assisted by the tides? Quaternary International, 188, 24-30; doi:10.1016/j.quaint.2007.06.028. Mazzarela, A. and Palumbo, A., 1994. The Lunar Nodal Induced-Signal in Climatic and Ocean Data over the Western Mediterranean Area and on its Bistable Phasing, Theoretical and Applied Climatology 50, 93-102. Treloar, N. C., 2002 Luni-solar tidal influences on climate variability. International Journal of Climatology 22 No: 12 pps: 1527-154 2002 DOI: 10.1002/joc.783. Camuffo, D., 2001. “Lunar influences on climate”Earth, Moon and PlanetsVols. 85-86: pps 99-113. Cerveny, R. S. and Shaffer, J. A., 2001. “The Moon and El Nino”Geophysical Research Lettersvol 28, No. 1. pps 25-28. Chain, A. C-L., Kamide, Y., Rempel, E.L., and Santana, W. M., 2006. “On the chaotic nature of solar-terrestrial environment: Interplanetary Alfven intermittency”. Journal of Geophysical Researchvol111, A07S03, doi:10.1029/2005JA011396. Cook, E. R., Meko, D. M. and Stockton, C. W. 1997. “A new assessment of possible solar and lunar forcing of the bidecadal drought rhythm in the western United States”. Journal of Climate vol 10 pps 1343 -1356. Currie, R. G., 1987. “Climatically induced cyclic variations in United States crop production: Implications in economic and social science”, in Erickson, G. and Smith, C. R. (eds) Maximum Entropy and Bayesian Methods in Science and Engineering Cambridge: Cambridge University Press 1987. Currie, R. G. 1987. “Examples and Implications of 18.6 and 11 year Terms in World Weather records” Chapter 22 in Rampino, Michael R., Sanders, John E., Newman, Walter S., and Konigsson, L. K., Climate: History, Periodicity, and Predictability. Essays in honour of the 70th Birthday of Rhodes W Fairbridge. Van Nostrand Reinhold USA. Currie, R. G. 1995. “Variance contribution of Mn and Sc signals to Nile River Data over a 30-8 Year bandwidth” Chapter 3 in Finkl, Charles W., (Editor) Journal of Coastal Research, Special Issue No. 17, Holocene Cycles: Climate, Sea Levels, and Sedimentation. A Jubilee Volume in Celebration of the 80thBirthday of Rhodes W. Fairbridge. Coastal Education and Research Foundation. DaSilva, R. R., and Avissar, R., 2006. “The impacts of the Luni-Solar Oscillation on the Arctic Oscillation”. Geophysical Research Letters 32, L22703, doi:10.1029/2005GL023418,2005. McKinnel, S. M. and Crawford, W. R., 2007. “The 18.6-year lunar nodal cycle and surface temperature variability in the north-east Pacific”. Journal of Geophysical Research vol 112, C02002,doi:10.1029/2006JC003671; 15 pps. Wood, Fergus J. 1986. Tidal Dynamics: coastal flooding, and cycles of gravitational force. D Reidel Publishing Co. (Note: this is a revision of Wood, Fergus, J. 1978. The Strategic Role of Perigean Spring Tides in Nautical History and North American Flooding U. S. Department of Commerce, National Oceanic and Atmospheric Administration Washington D. C., U. S. Government Printing Office). Wood, Fergus J., 2001. Tidal Dynamics Volume 1 theory and analysis of tidal forces. Third Edition Journal of Coastal Research Special Issue No. 30.Coastal Education and Research Foundation. (Note: this is a revision of the theoretical and analytic elements of Wood (1986). It includes new material written by Fergus Wood plus several additional papers of the author. It includes new computational material. The author, with the assistance of Emeritus Professor Rhodes Fairbridge, reorganized the text substantially resulting in a book in the standard textbook format. Fergus completed the book in 2000, but died that year before the new work was published in 2001. Wunsch, C. and Ferrari, R., 2004. Vertical mixing and the general circulation of the oceans. Annual Review of Fluid Mechanics, 36, 281–314 doi: 10.1146/ annurev.fluid.36.050802.122121. Yndestad, H., 2006. “The influence of the lunar nodal cycle on Arctic climate”, International Council for the Exploration of the Sea (ICES) Journal of Marine Science, vol 63, pps 401-420. I agree with Jeff’s opening statement that Arctic ice changes are more likely an ocean current issue than an (atmospheric) temperature issue. An earlier post on WUWT showed an oscillation in Barents Sea (water) temperatures of as much as 4 deg C in direct correlation with the AMO (Atlantic Multidecadal Oscillation). (1) Arctic ice extent is indeed likely dominated by surrounding sea temperatures under the influence of currents, with the example of the Barents Sea; not by air temperatures. (2) The magnitude of the Barents Sea AMO-correlated temperature oscillation – 4 deg C – suggests that it is also current derived. The most likely mechanism is that the strength of the North Atlantic Drift current oscillates with the AMO. The Barents Sea is at the tail end of the North Atlantic Drift. Its temperature is thus determined by how much water it gets from the North Atlantic Drift. (3) Arctic Ice extent will continue the trend to increase year by year that started from 2007, now that the AMO is on a down cycle. Needless to say, atmospheric CO2 is totally irrelevant to arctic ice extent. Each ocean varies in it’s rate of energy release to the air. The PDO is the largest example and the oceanic energy from persistent positive El Ninos for 30 years in the late 20th Century eventually peaked in the Arctic Ocean (via the process described in the above paper) in late 2006 resulting in a record ice loss in 2007. We now ought to know that interannual and multidecadal climate changes are ocean driven. All that remains is to firmly link the 1000 year cycle from Mediaeval Warm Period to Little Ice Age to Modern Maximum to an oceanic driver and I have already provided some evidence for that in the form of the position of the ITCZ during the Little Ice Age. To then ascertain whether CO2 emissions have any effect at all we need to know whether the AGW ocean skin theory has any real world validity once the inevitable increase in evaporation is taken into account. If not, then the warming effect of CO2 cannot translate into a significant climate effect and simply causes a miniscule acceleration in the speed of the hydrological cycle. If so, then we need to firm up on the timescale because it seems to me it would take many millennia for the effect to become even barely measurable. I’ll submit that the strange relationship of the solar min/max is inverse to the temperatures in the Arctic for this warm current influx. Does the Spitzbergen current get enhanced during solar min or cut down during solar max? Somebody should staple this paper to the door of Boxer, Kerry & Graham. For AGW true believers, the typical dodge is ‘it is weather’. How is climate experienced, mate? Given Eric A’s comments (20:11), I quickly checked A. Bernaert’s other work. It seems he wants to prove that the sudden warming around Spitzbergen was caused by WWI naval warfare tearing up the oceans. And some letter I couldn’t understand (to Nature?) had a headline about legal means to prevent something regarding the ocean. He also seems to believes that the cold climate beginning around 1940 also has the fingerprints of warfare all over it. Nevertheless, I found the argument interesting given the data supplied. I would like other scientists of the ocean to weigh in. Especially I am interested in Bob Tisdale’s take on Bernaert’s claims. This is a very good article that has been well researched. It complements mine that detailed the earlier arctic warming of 1815-1860. Regular melting of the arctic can be traced back many centuries from the modern era right through to the Vikings and beyond to the Ipiatuk some 2000 years ago. Todays conditions are by nio means ‘unprecedented’ and should be seen against the backdrop of the broader sweep of history. Is the Arctic Ocean current carrying the pictured polar bear south? If so, will more and more polar bears end up on the east coast of the United States in the future? I am willing to pay carbon taxes to ensure that polar bears don’t meet New Yorkers. Thank you Jeff, for presenting this interesting paper and many thanks to Arnd Bernaerts for this great piece of work. Let me also take the opportunity to draw attention to a tool, which I find very helpful (if not already known). Here you can download a file which gives all GISS-Temperature Stations on Google-Earth (7.4 M download). ____2. “Climate change” means a change of climate which is attributed directly or indirectly to human activity that alters the composition of the global atmosphere and which is in addition to natural climate variability observed over comparable time periods. ____3. “Climate system” means the totality of the atmosphere, hydrosphere, biosphere and geosphere and their interactions. In the letter to Nature it was suggested to define climate as the continuation of the oceans by other means. CONCLUSION if states would protect and preserve the marine environment that would do the most to prevent destabilizing the climate system. (PS: Provided that States would know sufficiently what oceans and seas require for being protected and preserved) . Thanks for this article. Lots of food for thought here. And for once it is “just outside my doorstep”. I have long considered that the sudden and large temperature swings we get in Scandinavia during the winter is due to shifting air currents (what else can it be). I think the longer term swings is a similar effect. But I am no expert. I shall read the article a couple of times. Well I can manage about two on screen pages, before I have to print everything in order to read it; which probably explains where that seven foot high stack of paper in my office came from. But I have always assumed that currents must affect polar climates, simply because the temperature gradients from the equator to the poles would dictate that “heat” must flow north and south from the equator; both in the atmosphere and moreso in the oceans, since most of the solar energy goes directly into the oceans. Then in the Arctic you have the fact that it too is an ocean with its own local currents. So is it the local currents you are alluding to Jeff in your piece; or are you suggesting the currents from the equatorial regions have changed. In any case I would expect any warming trends to show up in the polar regions; if for no other reason than the radiative cooling of the polar regions is way down from the tropical cooling rates, so the colder polar regions are unable to lose thermal energy as fast as the tropical regions can send it polewards via ocean (and atmospheric) currents. Then of course in the atmosphere you have this Hadley Cell business apparently, that complicates the atmospheric circulations. That was a tour de force exposition of how ocean currents have well-attested links to solar system cycles, particularly that of the lunar nodal cycle. I had no idea so much has been carefully (I trust!) explored. I’d love to see a whole post here from you on this, as well as one from Paul Vaughan – because I am more and more certain that our CLIMATE indicators have to be sought in the interaction of cosmos with the whole earth + oceans + air. With an ardent plea, make it comprehensible to beginners and don’t just give cryptic hints! With secure, stable, long-term funding to devote full-time to this pursuit, that might be more feasible …but as you know this work is a hot potato that admin people don’t necessarily want on their paper trail. The practical approach is to keep exploring new terrain rather than wasting time on-the-sell in a buyer’s market. If the group-think tide changes, demand may make it feasible to go with the flow (with a good supply already on the shelf). A WUWT poster offered this a few days ago. Apologies to whoever it was, I don’t remember or I would attribute. Arnt Bernarts, thanks for clarifying a point about which I was confused and thanks for an interesting article. I appreciated TonyB’s comments because he has done extensive work on the historical climate of the Arctic . Also Jeff Id keeps us informed about climate change, with magnificent animations, in the Arctic. Would his work along with your tracing ocean currents via temperature changes in selected “cities” bring us any closer to an understanding of these unusually warm episodes? Why those warm currents at those times? What other changes (in the oceans) are they connected to? If you email me at epitrochoid@hotmail.com, I’ll send you my J of E&E paper’ the title of which is ‘The Sun’s role in regulating the Earth’s climate dynamics’. I can do the same for anyone else that wants it, too. b) other things that are a part of tensions that lead to / affect war. It would be quite a complicated study to disentangle the details. Figure 6 (andenes annual mean temperature) bottom title lists the dates as 1981-1945. Shouldn’t that be 1881-1945. IIRC, we had a post a few weeks back that the Gulf Stream had slowed. Wonder if this could have had an effect on the recovery of Arctic sea-ice this year? Ocean currents seem to be influenced by many factors and I think Richard Mackey’s post above is a good description of the link to LNC. Ocean fluid dynamics are still an area where much work needs to be done before it’s impact on climate can be fully quantified. Scientisits will again have to battle the dynamics of a non-linear system to achieve this. Not easy when the combination of factors like gravity, magnetic field, temperature, salinity, current strength e.t.c. need only vary by a very small amount to have a massive effect. I am willing to pay carbon taxes to ensure that polar bears don’t meet New Yorkers. – Tim S.
It is almost worth it to pay more taxes to see polar bears floating south to DC so they can feed in Congress! Maybe Al Gore needs to meet a polar bear face to face. To echo Lucy’s comment and gratitude for so fascinating a post on LNC and planetary system influences. While barely digesting the magnitude of this work, it seems appropriate for big iron modeling to be applied here. How current climate models are expected to do anything more than fail without acknowledging such complex influences is beyond comprehension. Together, Arnd Bernaerts and Mackey’s posts provide enough food for thought to immediately dismiss the conclusions of AGW proponents as woefully undereducated. On the positive side is an opportunity to redirect efforts to understand Earth’s climate and (potentially) its preservation, toward oceanic and planetary influences. ” The Chaldean equivalent of Rajendra Pachauri knew that fame, fortune and great power would be his if he could persuade the powers-that-be that he could predict things and make the powers-that-be seem godlike to the masses. A lively and thought-provoking start to the day here in the PST zone. Apologies to Jeff for not acknowledging his hand in bringing Bernaerts work to WUWT. Thank you for your splendid efforts. yes, this paper is peer reviewed and won the 2. place of the quality voting. “Thanks for this article. Lots of food for thought here. And for once it is “just outside my doorstep”. Hi Carsten. It is even closer to my doorstep (Ålesund). The weather here on the west coast is dominated by mild and humid air from north western atlantic/eastern US. This gives us mild and wet winters and chilly and wet summers. When the air currents shift to north easterly in winter, we get cold Siberian air and frost. When air currents are from northwest, we get cold air from Greenland/Arctic mixing with humid atlantic air to produce snow. So yes, air currents are responsible for shifting weather. However, the main driver of weather here is the Gulf Stream, providing a much milder climate than our latitude otherwise suggests. You guys in the eastern part of the Scandinavian peninsula do not get the same effect from the gulf stream because of the central mountain range in Norway, running from far south to far north, prevents the mild and humid atlantic air from reaching your areas. That is why you experience much drier and colder weater in winter, as well as drier and warmer summers. Cheers. That is very interesting. Maybe I will look up Harald Yndestad at my old alma mater to hear what new plans he is developing. JAN, Takk for notater. The patterns you describe for the Scandinavian peninsula have many parallels with those for western North America. How many days per winter month, on average, would you estimate have winds under 15 knots in & around Ålesund? 1) Vondrák, J. (1999). Earth rotation parameters 1899.7-1992.0 after reanalysis within the hipparcos frame. Surveys in Geophysics 20, 169-195. 2) Vondrák, J.; & Ron, C. (2005). The great Chandler wobble change in 1923-1940 re-visited. In: H.-P. Plag, B. Chao, R. Gross, & T. Van Dam (eds. ), Forcing of polar motion in the Chandler frequency band: A contribution to understanding interannual climate variations, Cahiers du Centre Europeen de Geodynamique et de Seismologie 24, 39-47. Have a look at that picture of a polar bear and study the sea surface around it. Can you see the pollution? Those pale streaks in the background, that’s probably oil. But what about the lesser trails from the back right of the floe which wander off into the far distance? Do ice floes concentrate pollution? If they do then there’s a good feedback mechanism. Oil reduces the albedo of water surfaces, so a melting floe releasing pollution should further warm the water, melting more ice. Feedback! Tipping point! Panic! 92 million gallons of oil goes up in smoke each year, so there’s a neat mechanism for getting it there. I am not sure if this has already been mentioned here (too much to read). It seems to me that increased CO2 in the atmosphere, is more likely due to the ocean warming, and probably the most likely cause for the ocean warming is volcanic activity in the sea bed. As water temp increases it’s ability to contain dissolved gases (CO2) is reduced, so CO2 is emitted from the ocean due to warmng of the sea from volcanic activity. This seems just as plausible (or probably more so) as CO2 emissions produced by man. And yes I agree with comments made that ice melting is more likely due to warm water currents and not air temperature. This is a highly complex issue for anyone to claim they know the true cause of this warming are either highly arrogant or ignorant.